Shower budgets are tight (anyone with 3 kids like me can relate to budgets!) and time to maintain them is even tighter. People want to have more function in less space (just check out the growth in the “not so big home” and “tiny home” movements). To make things even more challenging the desire for a higher level of style and luxury escalates every time we check into a sleek, contemporary hotel room. 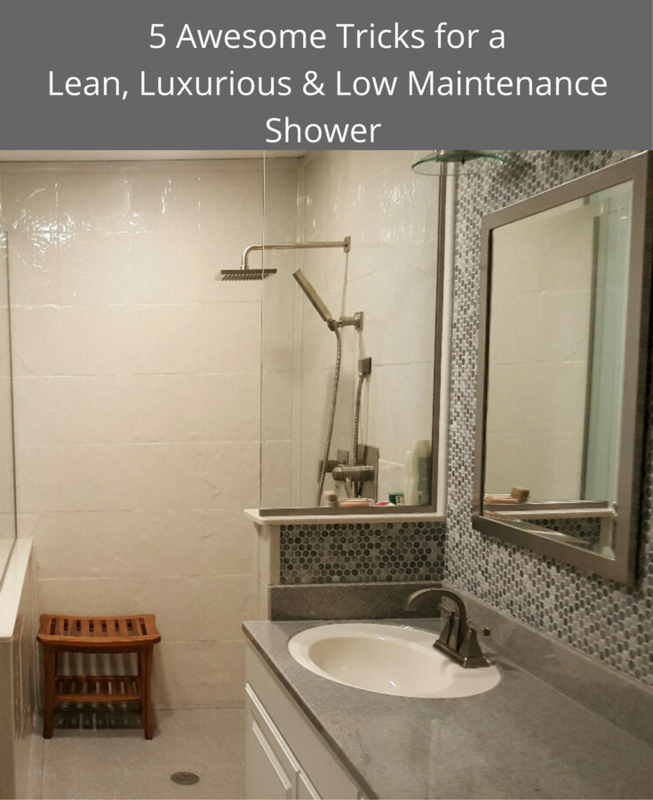 How do you combine lean (in size and price), luxurious and low maintenance into a new shower project? 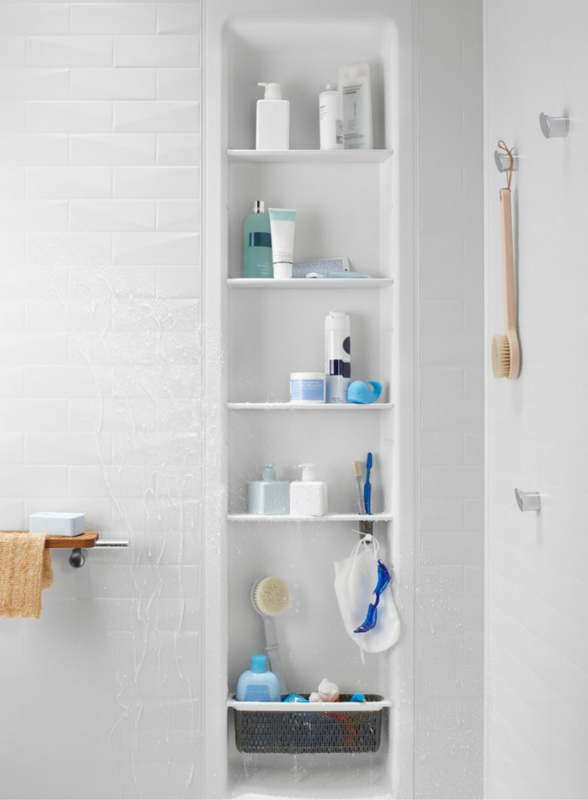 You’ve got to dig into these 5 “tricks” to get the “treat” of a shower which will last (without a lot of maintenance effort from you) and look great. Let me know at the end which trick can help you the most. Tile showers are a pain – and not because of the tile. Most people LOVE tile, they HATE grout! If you want to have a low maintenance shower the time is now to ditch grout and go with grout-less shower wall panels. Yes – there are some cheap and flimsy ones you’ll see at your neighborhood home center store. I would not recommend buying these. They usually look as bad as their price cheap tag would suggest. Go a bit more upscale and research DIY friendly systems. 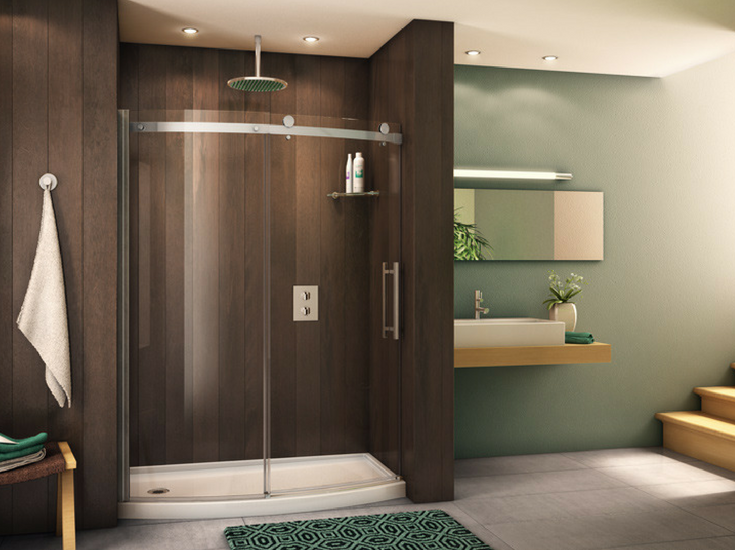 Three systems you’ll want to consider are PVC composite walls, laminated shower panels and solid surface shower panels. 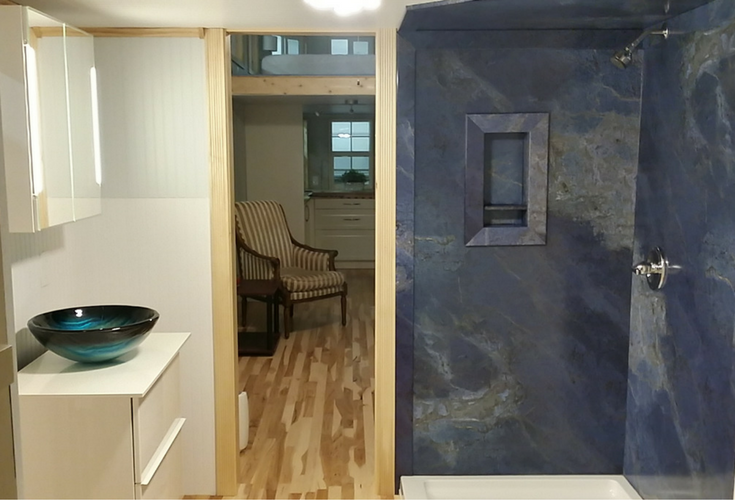 If you’re looking for the system with the most realistic look of tile or stone the laminate option is the hands-down winner (and it’s also nice that they come in simple to install 2′ x 8′ panels which makes the simplest system of all to bring into your bathroom. Check out both the laminate and PVC composite system pictures below. While they will be a bit more costly (in initial purchase price) than tile, in the long run they will save you cost and time by not having to deal with grout maintenance. Shampoo, soaps, loofa sponges, exfoliating creams – the products to look beautiful seem to keep multiplying (isn’t it unfair our teenage kids can look great without all these personal care products. Getting older is a bummer – unless you’re the person selling these beauty care products!). Where are you going to put all this stuff in the shower? Instead of having your shower storage be built into the “belly” of the shower why not store your products inside the walls and save space? 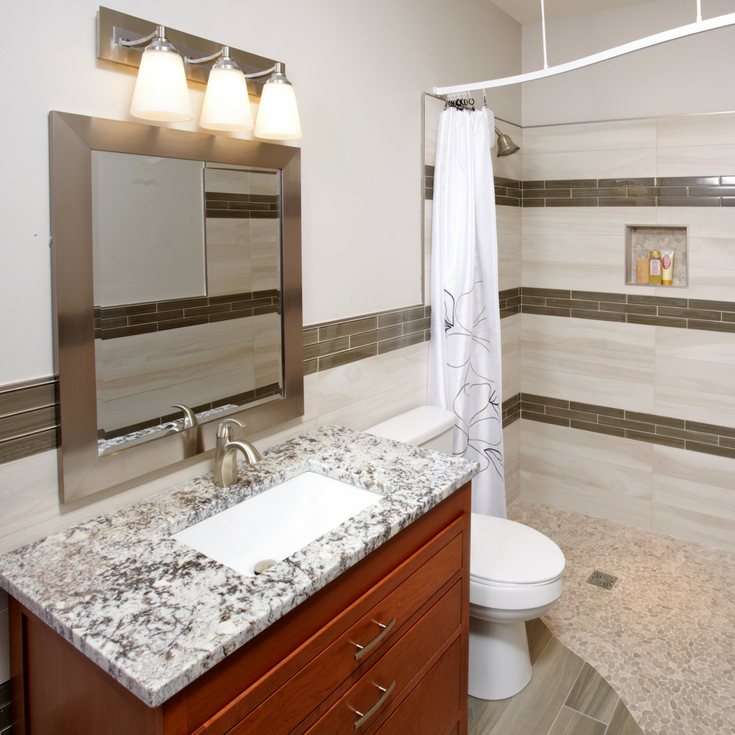 With proper planning, and the use of recessed niches, you can keep your too-tight shower square footage unencumbered and get the storage you need. Having a small space doesn’t mean it can’t be stylish (if you think this isn’t true think of the force IKEA has become!). The key to tight spaces as the IKEA has shown is to focus on design first. Shower enclosures are no different. One cool shower design idea from Fleurco (which can transform a small bathtub into a roomier and cooler shower) uses a curved front glass enclosure with a matching base. It curves out to 36” in the center so you have more elbow room than a traditional rectangular base. It is designed with the same standard curved glass (which is manufactured in larger quantities) so fashionable design becomes affordable. This sounds a lot like the IKEA business model to me. According to the Centers for Disease Control and Prevention over 235,000 people per year visit the emergency room because of falls in a bathroom. One big culprit of these falls is stepping over a 4-6” high shower curb. As we get older the risk of falling only increases. What’s nice know is you can add style and luxury while also increasing safety at the same time. Enter the one level wet room. With this system you can create a waterproof shower (and bathroom) without stepping over a curb ever again. Simple, smart and safe at the same time! Showers don’t have to be as tricky (or boring and traditional) as they have been in the past. You can get a leaner (price and size), more luxurious and lower maintenance shower than in the past. The key will be to dump some of the old methods and products most people will build a shower with. You may also need to ditch your “Frank Sinatra Contractor” (he’s the guy that only does it – your project – his way). 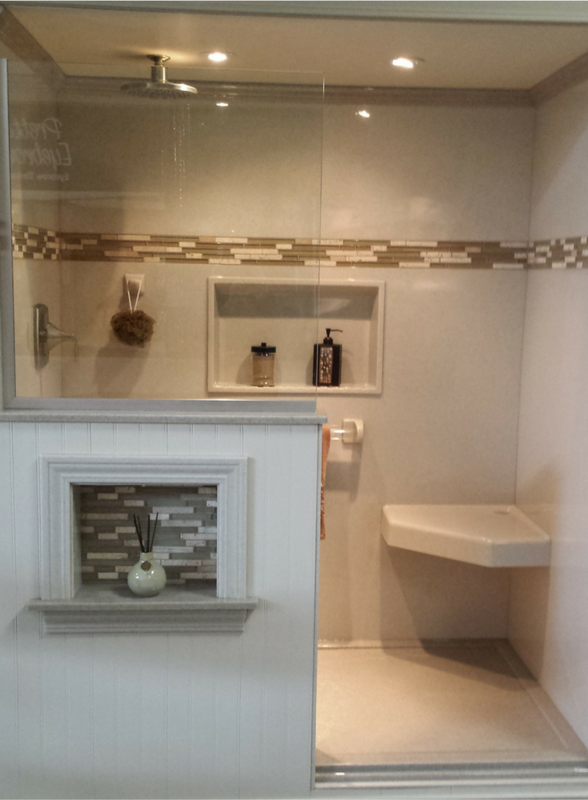 Lastly to use products and designs which can make a small shower live big with style and function. Which of these 5 tricks above do you feel is best for your bathroom remodeling project? Please comment or call the numbers below for a free consultation, design or wholesale product supply. For information and nationwide supply of grout free shower panels, unique shower enclosures or one level wet room systems contact Innovate Building Solutions at 877-668-5888. 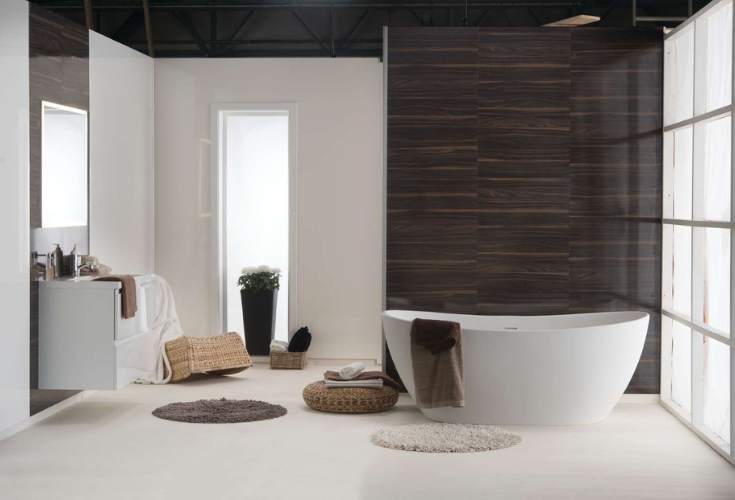 For a Cleveland bathroom remodeling project call Cleveland Design and Remodeling (216-658-1270) or The Bath Doctor in Columbus (614-252-7294). One thing that helps to keep shower areas clean is to treat the side surfaces with car wax (for the glass, I prefer a squeegee- check the manufacturer’s instructions). This will help to minimize the cleaning frequency because it will not allow hard water and soap scum from adhering to the shower stall walls. Just follow the instructions on the product label and make sure not to apply it on the floors because they will become slippery.